This paper reports the results of a doctoral research pilot study that paired a researcher with an experienced classroom teacher for a 12-week time span with the goal of effectively integrating the use of Geometer's Sketchpad (GSP) into the classroom teacher's practice. Using a teacher development experiment, the researcher created an apprenticeship model to foster the transmission of the knowledge to the classroom teacher required to successfully teach with Geometer's Sketchpad. Specific results indicate a positive change in the facilitation of mathematical communication and inquiry-based instruction in the classroom teacher's practice as well as sustained use of GSP beyond the time span of the pilot study. General results include the development of the constructs of technological knowledge (TK), technological pedagogical knowledge (TPK) and technological pedagogical content knowledge (TPCK). Shafer, K.G. (2008). Learning to Teach with Technology through an Apprenticeship Model. 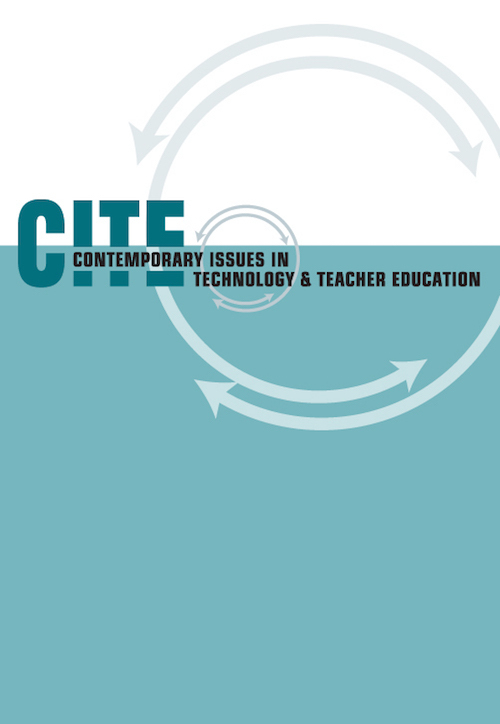 Contemporary Issues in Technology and Teacher Education, 8 (1), 27-44. Waynesville, NC USA: Society for Information Technology & Teacher Education. Retrieved April 19, 2019 from https://www.learntechlib.org/primary/p/26135/. Bennett, D. (1999). Exploring geometry with The Geometer's Sketchpad. Emeryville, CA: Key Curriculum Press. Cabri Geometry II. (1996). [Software]. Texas Instruments, Inc.
Chazan, D. (1993). High school geometry student's justification for their views of empirical evidence and mathematical proof. Educational Studies in Mathematics, 24(4), 359-387. Jackiw, N. (2001). The Geometer's Sketchpad (Version 4) [Software]. Berkley, CA: Key Curriculum Press. July, R.A. (2001). Thinking in three dimensions: Exploring students' geometric thinking and spatial ability with the Geometer's Sketchpad (Doctoral dissertation, Florida International University, 2001). ProQuest Digital Dissertation Database No. AAT 3018479. Laborde, C. (2000). Dynamic geometry environments as a source of rich learning contexts for the complex activity of proving. Educational Studies in Mathematics, 44, 151-161. Lester, M.L. (1996). The effects of The Geometer's Sketchpad software on achievement of geometric knowledge of high school geometry students. Unpublished doctoral dissertation, University of San Francisco. Margerum-Leys, J., & Marx, R. (2002). Teacher knowledge of educational technology: A study of student teacher/mentor teacher pairs. Journal of Educational Computing Research, 26(4), 427-462. Mariotti, M.A. (2000). Introduction to proof: The mediation of a dynamic software environment. Educational Studies in Mathematics, 44, 25-53. Niess, M.L. (2006). Guest editorial: Preparing teachers to teach mathematics with technology. Contemporary Issues in Technology and Teacher Education, 6, 1-9. Saye, J.W. (1998). Technology in the classroom: The role of disposition in teacher gatekeeping. Journal of curriculum and Supervision, 13(3), 210-234. Senger, E.S. (1999). Reflective reform in mathematics: the recursive nature of teacher change. Educational Studies in Mathematics, 37, 199-221. Shafer, K.G. (2004). Two high school teachers' initial use of Geometer's Sketchpad: Issues of implementation (Western Michigan University, 2004). ProQuest Digital Dissertation Database No. AAT3154510.